One of my favourite spots in Australia to sit, relax and feel the spirit of the country is on top of Ubirr Rock looking out over the Nadab floodplains and taking in the 360 degree view. The feeling is exactly what Natasha Nadji, granddaughter of Bill Neidjie, is talking about. The landscape and view is breathtaking and the cultural heritage and history is humbling and incredible. I truly feel the spirit of the Gagudju country as I look out over this landscape. I feel a strange connection to Ubirr, 4 visits can attest to that. I actually feel home. Kakadu National Park in Northern Territory, the Top End of Australia, is listed not once but twice as a UNESCO’s World Heritage site. Kakadu – or Gagudju as Kakadu is a European spelling error of Gagudju – is listed not only for natural but also for cultural values. I have written at lengths about Hawk Dreaming, a closed off non public site. In this post I will focus on two of the main public sites – Ubirr and Nourlangie (another spelling error, should be Nawurlandja). The Gagudju country will tell you the story of at least 25,000 years of occupation meaning at least 250 generations of Australians have lived and died here. 250 generations is a number so great it is hard to conceive and is why I balk when people say Australia is a young nation with no history. Oldest land in the world; oldest still living culture. Gagudju people had already been trading with the Macassans sailing over from Indonesia, but European contact in the late 1800’s proved catastrophic to 25,000 years of culture. From several thousands living here the number was already down to probably less than 100 in the 1920’s. Today, none of the old Gagudju people remain. Bill Neidjie, see photo kindly provided by Mark Lang, lived for about a year at Ubirr when he was very young and he was the last of the original Gagudju. Fortunately Kakadu National Park starting in 1979 was handed back to aboriginal management and ownership so a new generation of Gagudju can grow up and learn Gagudju law on their land. As you sit on top of Ubirr reflect on this and the fact that this is no museum. The landscape isn’t constructed. Ubirr has several major rock art shelters with some very impressive and important drawings and they weren’t brought here for an exhibit. This is real; this is a home. People lived here for 25,000 years and it’s still almost untouched by civilisation. Almost untouched. Almost. There are paved roads. There are fences, signs, tourists, tour guides and rangers. There are opening hours for the sites. 8am to sunset. You won’t exactly have the place to yourself. Ubirr and Nourlangie being the two main sites of Kakadu are easily accessible with paved roads and car parks for coach busses so they get very busy in the middle of the day. It is a good thing as many people will come, experience and learn; but it can be a bit hard to ignore the crowd and truly feel at one with the country. Arrive very early or very late in the day to avoid the crowd. Also; the tour guides pointing out where a few scenes from Crocodile Dundee were shot should be banned! There are more important stories about Ubirr. For true untouched Kakadu you have to go to Hawk Dreaming. At Ubirr you have to work harder to take it in and ignore the people. The rock art at Ubirr and Nourlangie is incredibly impressive. I am spoiled though having visited every accessible cave in Hawk Dreaming and experiencing amazing rock art up close and personal with just me and a guide, no crowds, no fences and completely untouched. I long for more when I view the art at Ubirr and Nourlangie standing on a boardwalk, behind a rail. You can’t sit in the cave and dream yourself tens of thousands of years back. You view from a distance in the company of tourists. Ubirr and Nourlangie are still incredible and do catch some of the aboriginal ranger talks, they’re fantastic. I’m just completely spoiled having had Hawk Dreaming all for myself twice. My dream is to someday be allowed off-limits access to Ubirr and be allowed to stay after sunset. Watching the moon light up the flood plains from the top of Ubirr must be true magic. Ubirr and Nourlangie can be as frustrating as they are fascinating. It takes a long time to get to know these places and create great images, Ubirr and Nourlangie will really test your skills for composition and shooting photos in difficult light. These are huge chaotic areas of savannah floodplains and rocks and won’t easily present some simplicity for you. It’s made even harder by the many closed off sections, the crowds, the opening hours. I still only have a few shots that I’m reasonably happy with and still; they’re not really art more like good stock images. Ubirr especially keeps kicking my behind every time I visit. Few photographers have mastered Ubirr and Kakadu. 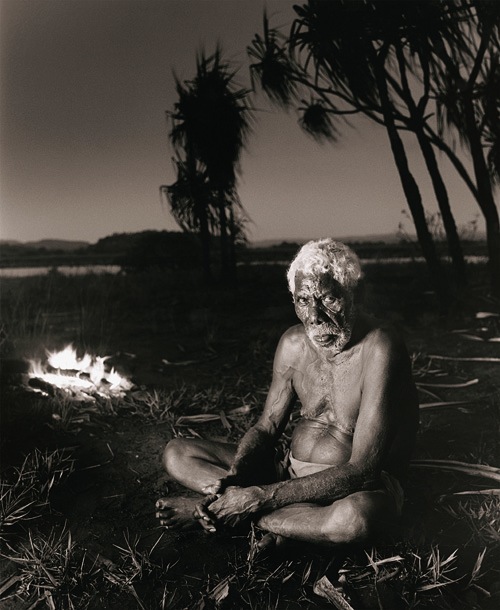 Mark Lang is at the top of my list, having spent 3 years here in the company of Bill Neidjie, his work truly captures Kakadu and is what I strive for. 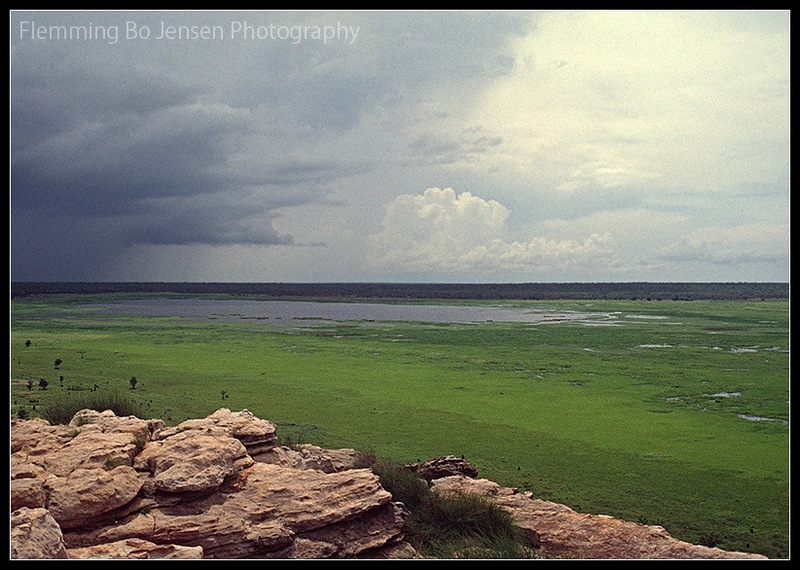 I have presented two stitched panoramas above which are my favourites from Ubirr and Nourlangie. The Ubirr panorama is not from the top of the rocks, but at the beginning of the climb looking North towards Cannon Hill in Arnhem Land. The afternoon light is still harsh but has warmed a bit and creates shadows compared to midday light. I lucked out and had a few clouds, most days in the dry season have none but this was late September and the buildup season was starting. I used an ND grad filter on the sky to bring out the colour. The Nourlangie Panorama is from the gun-warddehwardde lookout and is the spot for a good shot of Burrungui, the upper part of the rock. Again; lucked out with some nice clouds and it’s early enough in the day to still have light on the rock. Later in the day this is all in shade. The dry and the wet are two different worlds here as you can see. I recommend doing both, I want to experience more of the wet myself. The wet has amazing dramatic weather, everything is green, less people, but everything may be completely closed off and the humidity is unbelievable. The dry has clear dry days, but more people and less dramatic light. Try April or May just after the wet, or September or October just before the wet. Avoid June, July and August if you can. As great as it is sitting on top of Ubirr, it’s hard to shoot anything worthwhile from the top. Everything is below you and the horizon so the image becomes very flat and distant. Climb down and get closer to subjects so you can compose with some foreground and middle ground. Beat the crowd, get there very early or late afternoon! In the middle of the day you’ll be fighting tour crowds for position. Ubirr is great in the late afternoon, enabling you to shoot north and east getting all the main subjects in the frame. Nourlangie, the gun-warddehwardde lookout is only good before about 11am. Get there at 8am if possible. There are some great lookouts a short distance from Nourlangie like Nawurlandja and Mirrai which are great for sunrise and sunsets; I want to explore these some day. Ubirr and Nourlangie open around 8am so sunrises are not possible. They are open till sunset but be aware the rangers kick you out as soon as the sun hits the horizon. They don’t want people falling off Ubirr in the darkness of course, but this means no dusk light for us photographers. I have never stayed at Ubirr for sunset. I had planned to, back in September 08 but being by myself at Hawk Dreaming with all the time in the world including dusk light and with no people proved too great a temptation! As you stand on the Hawk Dreaming savannah at sunset you can actually see Ubirr in the horizon and all the flashes going off on compact cameras set to automatic mode! Check reflections off the rocks, they can burn out if you’re not careful as they’re usually the brightest part of a scene. Perhaps underexpose by about a 1/3 stop. Watch your step at Ubirr! Don’t look through the viewfinder and walk as you’re likely to fall off or at least break an ankle. Do visit the Warradjan Aboriginal Culture Centre as it is brilliant. Spend a few hours there and you will learn so much about Kakadu and aboriginal culture. Knowing a place also means connecting to the place resulting in a better experience and better images! Last but not least, experience! “If you respect the land then you will feel the land. Your experience will be one that you cannot get anywhere else in the world”. I have to apologise for not blogging much for the past month. I have ideas for articles and tutorials but haven’t found inspiration. Time has somehow slipped through my fingers, and winter depression kills my otherwise strong urge to write. So I’ll just stick to sharing a few photos this week and am even reusing a title and a few of the photos, talk about writers block! Sydney was originally named New Albion which works with New Angles as a title – and I am always looking for new angles. I have visited Sydney 5 times and this gorgeous city always offers new light and new opportunities. Here’s a few from my visit in September 2008. The first two shots are from across the bridge (obviously!) at Kirribilli Point, a superb spot for sunrise. It is a wonderful feeling to stand in a city of millions at 5am in the morning witnessing first light – with not a single soul anywhere! Just you and the light, as if you’re part of this big secret and no one else is awake to know this is the best and most beautiful part of the day! The story behind this shot is here and a few more new Sydney shots are in my Sydney gallery. Enjoy the photos as I will work on unblocking the writer block! Hawk Dreaming is a magical sacred place so it is only fitting I use a Hawk Dreaming image to show a bit of Adobe Lightroom 2.0 magic. The image was photographed at my beloved Hawk Dreaming, home of Bill Neidjie and the Bunitj clan, in Kakadu National Park, Australia. Long time readers will be quite familiar with this, newcomers can read more by clicking here. It is one of the most magical places in Australia and I twice I have been fortunate to visit this incredible place with just me and a guide from Aussie Adventures (the area is sacred and closed off, you cannot visit without a guide)! This is two images stitched with all post production done in the brilliant Adobe Lightroom 2.2. I develop the RAW files in Lightroom and then export for stitching in PTgui. I find Lightroom to be so intuitive, easy and powerful that I then import the stitched panorama tiff file back into Lightroom to do final post processing! Lightroom was made for photographers and version 2 is brilliant. For pixel editing, layers and masking etc. you need Photoshop – but Lightroom is now about 90% of my post processing workflow as Lightroom offers post production in such an easy non-destructive intuitive way that creativity is always at the forefront and not technical Photoshop skills. Lightroom 2 offers some amazing features that I use a lot: Virtual graduated neutral density filter, Retouching brush, Spot Removal and post-crop vignette. You can accomplish the same using layers and masks in Photoshop, but it is a longer workflow and in Lightroom it is just too easy. You’ll be laughing as the Aussies say. Grad filter emulates a real grad filter but you can add as many as you like and then have the filter change exposure, contrast, saturation etc. This video shows the filter in action. I shot this using my Cokin ND grad filter but still ended up with a dim foreground as the dynamic range is huge. So I used a grad filter in Lightroom to add some contrast to the sky and lighten the foreground as I am shooting into the light and also another filter to brighten the foreground. Adjustment brush enables you to paint in adjustments such as contrast, exposure, saturation to localized areas of the image. I used it in this image to paint light back onto the ranges. Post-crop vignette is simply the easiest and most powerful vignette feature. Spot Removal is an easy way of healing dust spots and as this was shot at f/22 with a dusty Canon 5D sensor I had quite a bit of spot removal to do. Too easy in Lightroom! The small web version (downsizing can heighten contrast and saturation) here makes it look perhaps slightly overcooked but the full size large version is sweet . Hawk Dreaming. Adobe Lightroom. I highly recommend a magic location with a touch of software magic! Broome is a small but extremely popular tropical town in Western Australia and gateway to The Kimberley. It is sometimes marketed for tourists as a tropical paradise with the 22km long Cable Beach complete with camels as the main feature. I reckon small and quiet outback town is much more describing. The weather is tropical and perfect in the dry season – where the town is not so quiet as the population of roughly 15,000 people triples around July! I have somehow ended up in Broome 3 times so far and love slipping into “Broometime” and hanging out here in perfect climate with quirky, funky and weird residents in a charming outback atmospheric town. Sun Pictures Cinema in Broome; world’s oldest picture gardens! – bring a pillow as the deck chairs get a bit uncomfy! Broome is a great place to relax for a few days either before or after your Kimberley outback trip. Just remember to not get stuck in “Broometime” sunbaking on the beach all week but get up the Gibb River Road and experience the Kimberley Outback!